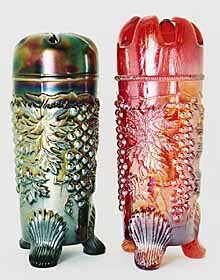 The fake Grape and Cable hatpin holder (on the right in photo above) looks much like the original except the top flames are not pushed down as much as in the original and the mold work seems crude. I've seen these in blue and green as well as the red. On eBay they typically sell in the $20 to $30 range but I've seen them sell for as little as $7 and one for $86, apparently bid up by a couple of uninformed buyers. 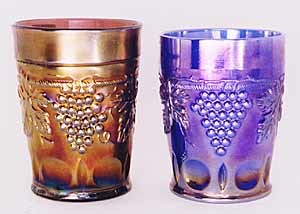 Above, the fake tumbler is on the right. Both have stars in the base and similar designs, but the fake doesn't have the thin indented band above the cable that the original does.